The Animal and Plant Health Agency (APHA) has warned that there is growing concern that African swine fever (ASF) will spread across the Belgian border into France. 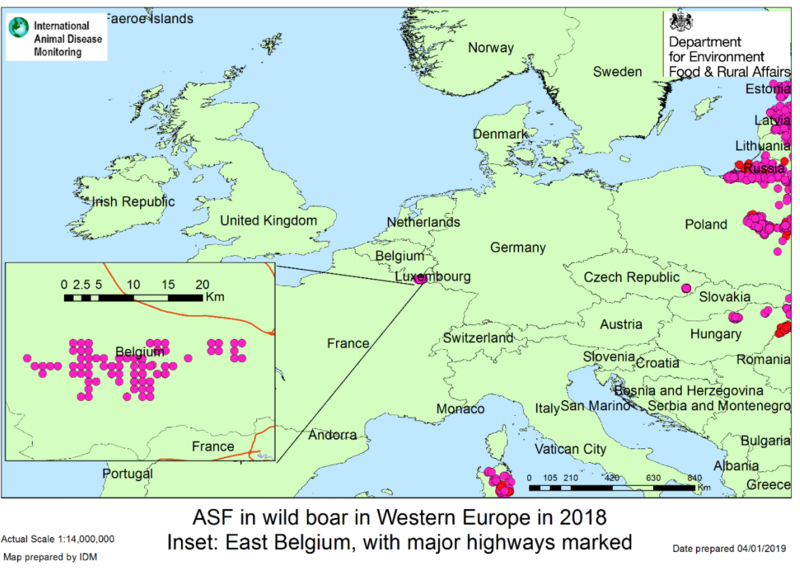 In its latest update on ASF in Belgium, APHA said the authorities had reported 245 case in wild boar (out of nearly 700 dead animals tested) in the Luxembourg region, close to the French border by early January. According to a briefing forwarded to the NPA by ForFarmers’ Andrew Knowles, this figure has now risen to close to 350 positive carcases. The infected region is close to the border with France, within a forested area of nearly 80 km2. “There is now concern that ASF will spread into wild boar in France,” the APHA briefing stated. On December 20, 10 wild boar carcases were found on the Belgian side behind the installed fences in the peripheral zone in front of a container park in Meixdevant-Virton, a Belgian border town not far from Thonne-La-Long (North-eastern France). A few days earlier, another carcase had been found not far from Gerouville, north-west of Meix-devant-Virton, less than a mile from the French border. ASF has since been confirmed in some of those carcases, prompting the French authorities to step up their defences against the virus, including a wild boar cull, building a fence close the Belgian border and ceasing activity in the forest. “We are now at a maximum risk level,” a French Ministry statement said. The only consolation remains that there have still not been any cases in domestic pigs. Belgium preventively culled all 5,000 domestic pigs within the infected area soon after the virus was discovered and has implemented strict control measures. This includes a ban on most activities in the forest, including logging, causing economic losses for the region. The commercial pig sector is located over 200km away, in the Flanders region. The Belgium livestock sector is lobbying the Government to introduce stricter controls, including culling pigs on commercial farms that are still in the current zone and eradicating the wild boar population in the zone. APHA has also published an updated risk assessment on ASF in Eastern Europe. There is better news in that the number of cases in domestic pigs across the affected countries has fallen every month since July. There were just 27 cases recorded in December, including 22 in Romania, four in Ukraine and one in Moldova. This compared with a total of 437 in July. In contrast, the number of cases in wild boar has remained consistently high and has increased in December, with Poland reporting almost half the cases. However, there have been no new large geographical jumps in December, and increased numbers of ASF-positive wild boar may be related to the stepping up of surveillance programmes in some places, APHA said. APHA confirmed that the risk level for entry to the UK still remains at ‘medium’, after it was raised towards the end of last year. The risk of exposure to the UK pig population is still considered to be ‘low’ although the situation is being kept under review and is still highly dependent on the level of biosecurity on individual pig premises but is. The agency added: “Under winter conditions, it is more difficult to effectively disinfect vehicles and equipment, and, the ASF virus persists at low temperatures for many weeks.